*Note: Reagents are commonly referred to as Regs. Reagents are commonly used when casting magic spells. Reagents are also commonly used to craft potions and magic scrolls. 1) Mage vendor shops in most towns. (Note: Joining the mage guild by using the command (Guidlmaster Name) Join and paying a fee of 500gp will decrease the price of some reagents sold by NPC Mage Vendors. 2) Faction vendors. These vendors can be obtained only if your faction controls a town and has enough silver in said town to place a faction vendor. 3) Player Vendors. Several players have stocked vendors commonly found in Yew or Occlo. Prices Vary. 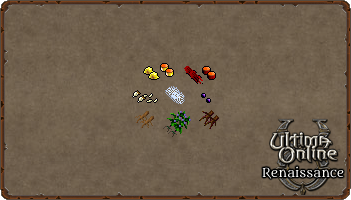 4) Scavenging reagents found on the ground throughout the world. You can add each reagent to your scavenger agent within Razor to automatically pick up reagents as you adventure. This is not a primary way to obtain reagents. 5) Monsters. You can obtain reagents from some magic casting monsters throughout the world upon killing and looting them. - Spider Silk: 3gp Ea. - Sulfurous Ash: 3gp Ea.